I have separated the black birds into their own group to assist in identifying them. Included are the Cracticidae, Corvidae and Corcoracidae families - whose total Australian contigent totals 16. Cracticidae - Butcherbirds (5), Magpies (1) and Currawong (3). Corvidae - Crows (2) and Ravens (3). Corcoracidae - Apostlebird (1) and Chough (1). I have taken the liberty of including the Magpie Lark in this group - again to assist in identification - and may include other black birds accordingly. The Australian Magpie has one of the most beautiful calls. Its white collar and red eyes distinguish it from other black birds. 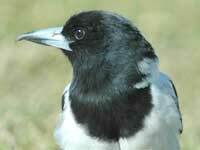 The Black-backed Magpie is found in eastern Australia. The juvenile Australian Magpie has a grey mottled look, and its eyes are brown. It tends to follow its parents around screeching to be fed - even when it is nearly fully grown. 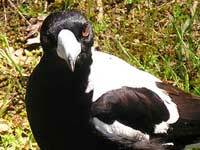 The Western Magpie has a white back and is found in south-western Australia. 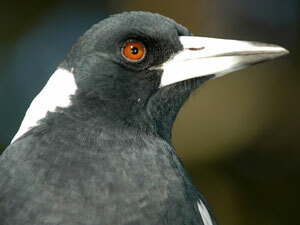 The female Australian Magpie's white collar is mottled grey. 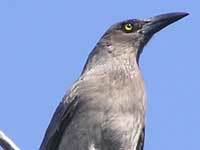 The Grey Currawong occurs across the southern Australian states. It has several variations including brown and black. 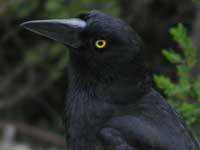 The yellow eyes help identify it as a Currawong. Found in eastern Australia, the Pied Currawong is often heard referred to as a magpie - but its yellow eyes and all black collar readily distinguish it. Identified by their grey back and white lores (patch between the eye and the beak). 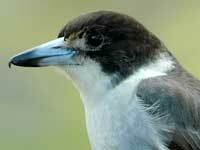 Butcherbirds' beaks have a blue tinge. 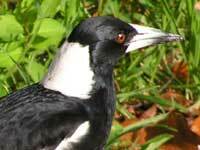 The Pied Butcherbird is found in most parts of Australia. 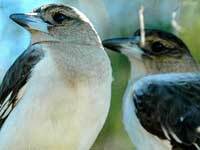 Butcherbirds are easily identified by their characteristic hooked-beak. 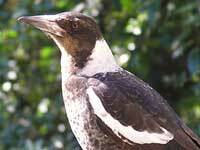 Immature Pied Butcherbirds are distinguished by the grey bib - which turns black as they mature. 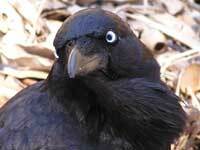 The Australian Raven is all black and has white eyes. Ravens are distinguished from other "black birds" by the shaggy feathers on their throat. 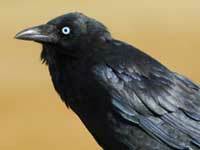 The juvenile Australian Raven has light blue eyes. 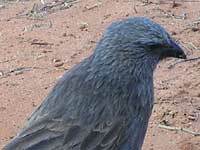 The Apostlebird is a ground forager - where it is frequently seen. It is found in non-coastal Queensland and NSW. The birds at Mungo seem to be bluer than the browner ones found in reference books. The White-winged Chough (pronounced "chuff") is identified by being all black with red eyes and a slightly hooked/bent beak. The "white winged" is a large white patch under its wings. 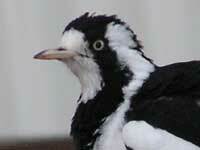 The Magpie-lark is smaller than the Magpie. It is widely known as the Peewee due to its call. 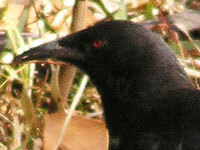 The male has a black throat and a white patch over his eye.